The National Alliance for Biofuels and Bioproducts (NAABB) consortium, the 33+ member collaboration of government research laboratories, university labs and private industry, recently announced achieving the first milestone in their $50+ million dollar, three year, project to refine the process of developing algal biofuels. This milestone involved producing a sample amount of biodiesel that meets ASTM standards. Santa Fe, New Mexico-based Eldorado Biofuels, one of 13 industry members of the NAABB consortium, provided the algal oil for these tests. Up until recently a low profile player in the algae arena, Eldorado Biofuels has developed a niche that may not have received much attention so far, but has the potential to make a strong contribution to algal farming. Addressing the issue of growth water for algae, Eldorado is targeting “produced water”—the water that comes up from oil wells along with the oil & gas—and treating it to remove the toxins, while leaving in the nutrients beneficial to the algae’s growth. 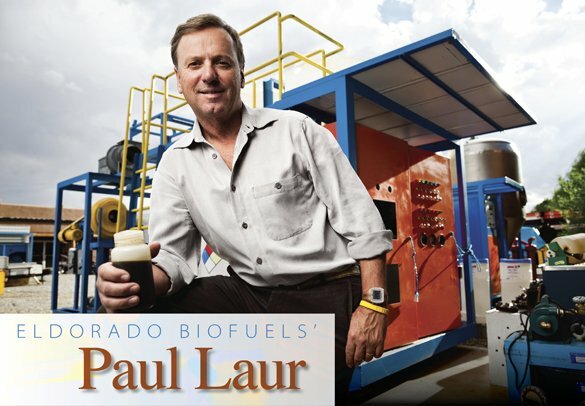 We recently dropped by the office of Paul Laur, CEO of Eldorado Biofuels, to get the inside story. So he returned to California to attend the Maritime Academy in Vallejo, and finished his degree in nautical industrial technology, simultaneously acquiring a Third Mate’s license for commercial ships. “My last year there I went to a symposium on wind ships and as a result of that landed a government contract to do a feasibility study on automated commercial sail systems on cargo ships to conserve energy,” he says. With that setback, Paul decided to get his Master Mariner’s license and went back to sailing oil tankers and cargo ships. He had just returned from four months in the Persian Gulf when the phone rang and an old sailing buddy told him that he’d started a tequila company called Patron, and he wanted Paul to set up a rum factory for him in Anguilla, in the British West Indies. So how did Eldorado Biofuels come together? It started about three years ago. A group of us were kicking around some ideas about recycling waste streams and were looking at doing something with a dairy farm. Charles Bensinger and I became friends over a series of meetings and we decided to form Eldorado Biofuels to create advanced biofuels from algae. I have a friend, Frank Yates, who is an investor in Santa Fe Cider Company. He was president of Yates Petroleum Corporation, a family based operation, and one of the top ten oil and gas companies in New Mexico. Charles and I made a presentation to them in Artesia, New Mexico, and came away with a promise to finance our research and development of water treatment systems for oil and gas companies. Over the course of working with Yates, I realized the value of providing competent operators to go along with our technology and we were able to obtain a WIRED Grant from the Dept. of Workforce Solutions to set up a biofuels operator training program at Santa Fe Community College. Charles decided that his interest was more in being an educator, so he left Eldorado Biofuels to take over the directorship of that program, and has been operating it now for a couple of years. I fully intend to hire people out of that program to operate our equipment in the field. How did Eldorado Biofuels get from that point to becoming a consortia member with the NAABB project? When oil and gas prices plummeted about two years ago our industry backing dried up with it, and there wasn’t money available for experimental projects. We were kind of stuck, after starting to build our water treatment equipment, so I began working on getting grant financing. After about the fourth attempt we managed to get involved in the NAABB consortium to continue what we had started—processing produced water for growing algae. Now we’re about ready to put our prototype commercial equipment in the oil fields of Southeast New Mexico, and we intend to market our technnology to oil and gas companies by the second quarter of 2011. The hurdle has been getting the equipment developed to the point and located where folks could see it in operation as opposed to us just talking about it. Tell us more about produced water, how it’s acquired, and what kind of condition it’s in. For every barrel of oil that’s pumped out of the ground, there are approximately nine barrels of water that come along with it. When it’s under the ground, it’s called “formation water.” These formations contain pre-historic oceans where the ancient algae has decomposed into oil. When it’s brought to the surface, it’s re-termed “produced water.” It’s separated at the ground level from the oil and gas, and the water is then typically re-injected into deep wells for disposal. The water has salts and various minerals in it, and it also has contaminants like hydrogen sulfide, ethyl benzene and xylene. The trick in using this water to grow algae is to remove the toxins, and that’s what we’re focused on doing. There are about 18 billion barrels of water generated every year in oil and gas production throughout the country. If we were able to utilize all of that water, we’d be talking about one and a half million acres of ponds to grow algae in. So your role with the NAABB is to supply the treated produced water for algae cultivation? That’s our particular goal in the NAABB consortium, treating produced water for algae cultivation, and on a higher level for the sustainability of the algae industry. But there are other members of the consortium that also have projects involved with the conversion of algae oil to biodiesel, and a lot of these projects were stalled waiting on the feedstock to get going. So, we were able to help out by supplying a couple of gallons of algae oil for these other projects to get underway. Usually the choices considered for growing algae are fresh water, seawater, or brackish water. There hasn’t been a lot of discussion in the media about produced water for growing algae. Is it cost effective? It is, and there is certainly a well-established market for treating produced water and in our opinion, it is competitive as well as eco-friendly. We can use this water and conserve other sources of water, such as brackish aquifers that also seem to affect the ground water table. If you are pumping brackish water out of the ground in, say, the Estancia Valley, ranchers have found by experience that once you start pumping down the brackish aquifers, the fresh water table drops as well. That can be a problem. The difference in produced water is that these oil wells are over a mile below the surface of the earth, so it’s thousands of feet below the fresh water aquifers, separated by solid rock, and the two are not linked. When the oil and water are extracted from the wells, they pump the produced water back down, in some cases, two miles below the surface, so that they’re not just recycling it back into the same formation that they are trying to get oil out of. That is an expensive process and if it weren’t for the oil involved, there wouldn’t be a reason to do it. So what we offer as an alternative to deep well injection is the beneficial use of this water. Part of the economic challenge of water, besides the supply, is its transportation from one place to another. Is there a suggestion, within this produced water approach, to pair that up with algal farms near the sources of that water? Absolutely. That is the key to making this economically feasible. You don’t want to be transporting the water long distances. And the beauty of produced water is that in many cases it’s already available in areas that aren’t being utilized for agriculture or for some other use. In New Mexico, it’s all on top of oil fields and scrub land. It’s right there in a land use area that is already energy intensive. There’s an infrastructure of pipelines and refineries and so forth where we could grow these algae farms and the people who are working in that area already understand energy. The oil companies are, in my opinion, allies because they understand the marketing, the distribution, and how the energy industry works. It’s unfortunate that there seems to be this perception that we are in competition with the energy companies. The environmentalists seem to feel that they are the bad guys, but everyone I’ve been working with in the oil industry, while they are certainly concerned about the bottom line so they can make payroll and stay in business, they are also interested in the future. So is using produced water for algae a natural evolution in the energy industry? It is, but it’s going to take some time. The oil industry in New Mexico took four generations to really get to the point where it is today. This isn’t going to happen overnight, but that’s one of the great things about being in this NAABB consortium, that we have a lot of tools to work with on these processes. And your ongoing involvement with NAABB will be working with the produced water and the cultivators in the program, testing and experimenting with that? Correct. Right now we are building the equipment, scheduled to go into the field sometime next month. Essentially, we’ll be treating produced water and supplying it to the algae cultivators in January. The cultivators will then have that running as a separate test in parallel with their cultivation water extracted from a well. Concurrently with the NAABB project, Eldorado will be running our own growth tests and feeding not just produced water, but industrial waste streams. We are focused on produced water as a main supply of water, but we are also looking at industrial waste streams, like from dairy farms and municipal wastewater treatment plants, to get some of the other nutrients. The idea is for this to be sustainable. I mean, you can grow some beautiful algae and extract some fantastic oil if you’re using lab water that’s been processed just the way you want it to be. But that’s not going to make money when you’re producing biofuel on a commercial scale. This is not going to be a glorious industry. It’s going to be a lot of algae farmers with mud boots and dirty jeans, and you won’t want to stand downwind of them! Most importantly we’ve got to look at recycling wastewater, and also the phosphates and the nitrates that are, in some cases, currently being imported from a mine in Morocco, spread on crops and then washed into the Gulf of Mexico creating big algae blooms and dead zones. My vision for an algae farm is that it becomes like a reservoir to capture all these nutrients and recycle them back into the food stream, and back into the fertilizer, and not allow those precious elements to get into the ocean where they entropy to the point where you can’t get them back. Where do you see Eldorado in five years? I believe we will be installing and operating produced water treatment systems in the oil fields of New Mexico and Texas, Colorado and Utah. There’s big demand and I really think we’ll be growing algae in that water on site in the oil fields, right next to the disposal wells. I don’t know how big we’ll be in five years. I know there are a lot of other companies out there right now that are managing to raise a lot of capital. We’re more of a brown bag operation—roll your sleeves up and get dirty. I’m not concerned about being the next ExxonMobil or cornering the market and getting all the business coming our way. There are over 800 oil and gas companies—energy companies—in New Mexico. There is a niche there for everyone, plenty of business to be had. What I don’t want to do is project some kind of rosy scenario to people and inflate the facts beyond all proportion just to raise money that, frankly, we haven’t needed up to this point. This Recovery Act funding has gotten us back on track to get our equipment in the field so we can show how it works. But, beyond that, I really expect that we’re going to be commercially viable and we won’t require any more government assistance. And in return I think we will create a lot of jobs and economic development in the rural areas that need it most. All those people in the oil and gas industry here, 30,000 of them, will need to prepare for the next evolution of the energy industry. Certainly the oil and gas industry, as it exists today, generates a lot of wastewater that we can recycle. That’s what I think is necessary.